It was a photo-finish for Leicester City, as a 10-man team salvaged an unexpected point courtesy of Harry Maguire’s last-second goal which saw the encounter end 2-2. Jose Mourinho will be furious with the result, as Manchester United seemed to have the match in the bag when Juan Mata’s brace canceled out Vardy’s early goal. With this, the gap between them and Manchester City has stretched to a daunting 13 points, which at this stage looks increasingly like a title already won for the Sky Blues. Here’s how the lads fared at the King Power Stadium. Poor showing from the otherwise world-class shot-stopper. While some slack can be cut for the Spaniard for being helpless in the face of Jamie Vardy, who was spectacular in ensuring that a perfect counterattack by the Foxes wouldn’t be in vain, the main moment of the match could have been stopped by De Gea. It almost appeared that he thought the match to be entirely over, and as of such, a curt fall into his own net was all he could manage as Maguire triumphantly scored the decisive equalizer. The usually form-shy Swede was actually in quite a good form for the encounter. A strong block by him in the second half ensured that Leicester were under pressure to score until the last minute. However, his absence in returning to position quickly was a major factor in Vardy’s opener. All in all, the man most responsible for the unexpected equalizer. 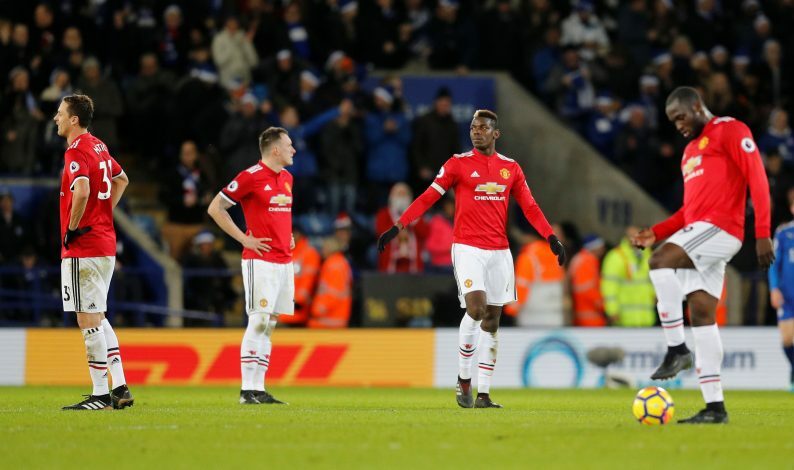 The injured defender couldn’t do much to stop Maguire, and it was treatment provided to him for the said injury that drew the match into its extra moments that provided the headlines. Apart from that, he was in brilliant form partnered with Jones, and supporters will be hoping that his injury isn’t long term. A real pity the match turned out the way it did, as Jones worked hard throughout the encounter, particularly in the dying minutes, where Smalling, due to his injury, was more or less absent from the match. However, he too was at fault in the equalizer reaching the back of the net, and in retrospect, much could have been done by the defense to ensure the situation didn’t occur. Surprisingly United’s best defender of the day, the veteran player did very few things wrong, if any. In the absence of Antonio Valencia, he continued his brilliant form, and the new defensive attribute to his play might mean that Mourinho won’t have to worry all too much about making a signing in that position in January itself. Back to his usual form after a few games where he seemed a bit sloppy, the former Chelsea man partnered quite well with Pogba. In the first half, in particular, it was his firm presence that dictated much of United’s initial link up into the offense. A return from suspension, he was awarded the captain’s band for the day. However, the Frenchman seemed similar to the one of last season due to the sheer number of shots he let go in vain, instead of passing it through. Regardless, his importance in the creativity of the squad is one that there is no doubt about. Easily the man of the match, but the Spaniard will be gutted to not taste victory. For the entirety of his stay on the pitch, he was the calmest mind and was very careful in his style of play. His first goal was an indication of the very same. His second-half free kick, on the other hand, was a textbook example of a spot-kick done right, and Mourinho might benefit immensely if he deploys him more often. The youngster was the creator of Mata’s initial equalizer, and was in great form for the rest of the match too. 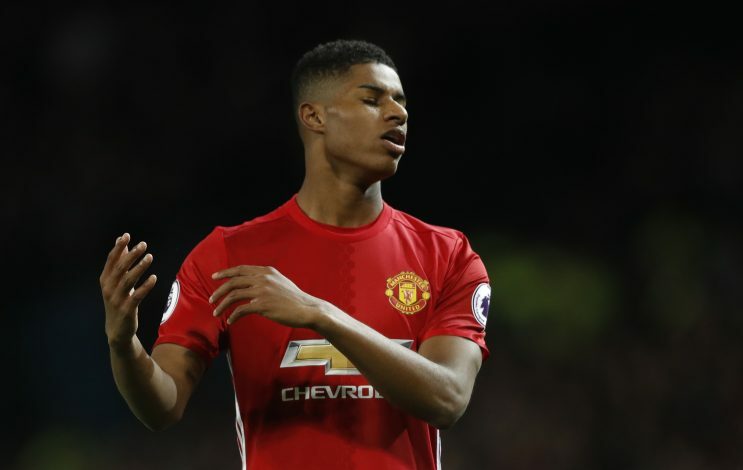 In contrast with Rashford and Martial’s knack for selfishness, a more mature aspect seems to be making its way into Lingard’s playing style, and it seems likely that Mourinho will use him more and more often after Saturday’s performance. While his miss in the second-half initially didn’t look like that big of a mistake, after looking at the full-time score, the Frenchman will be hitting himself in the head as he couldn’t put the match to rest. In his usual style of cutting into the penalty box, the former Monaco player was no different today, but lacked heavily in terms of finishing ability, and couldn’t prove to be a suitable partner for Lukaku up front. A match without a goal, but not entirely his own fault. Martial, Rashford, and Pogba were all guilty of not passing the ball to him when he was in a clear position to bury it in the back of the net, and in retrospect, that might have been United’s downfall in the encounter. Mourinho must find a solution to this quickly, as the player’s knack for finishing may go to waste otherwise. Another player who will certainly come under heavy criticism for how the match turned out to be. He was subbed on with the sole task of putting the scoreline definitely beyond Leicester’s reach and yet the exact opposite happened. Undoubtedly selfish runs, both of which could have been easily finished by Lukaku, were wasted by the youngster. While he did make a return to playing ways, his influence in the match was next to nothing due to the lack of time, and it was perhaps an attempt by Mourinho to show off his potential skills going into the transfer window. The man of the night for the King Power Stadium. While the importance of his late equalizer speaks for itself, his performance throughout the fixture was commendable too. A mature outlook, akin to that of a leader was regularly seen in his young features, and England could potentially have its next great defender in him. Arguably Leicester’s best player for the night, but he lacked in his usual spurt of creativity and didn’t pressurize the United defense much save for a couple of memorable runs in the final third of the game. The provider of the vital goal that salvaged the point for Leicester. His opener had the stadium roaring with appreciation, but after that, he almost disappeared from the fixture entirely. His red card after being shown yellow twice was anticipated by many to be the doom for the home side in the match, but it simply wasn’t to be. A great spectacle was gifted by City yet again to the spectators of the Premier League and Jose Mourinho and his lads will be heavily irked by how it all ended.